Public API - Extend it! Before going through documentation chapters, thanks for purchasing PrivateContent and trusting LCweb! Be careful using CACHE SYSTEMS. PrivateContent is based on dynamic content changes, then you MUST AVOID static cache systems (eg. WP Super Cache, WP Fastest Cache, etc). Basically this system associates one mirror WordPress user to a PrivateContent user. This is essential to let them interact with WP-based systems (comments, woocommerce, etc). Users will still be managed through the privateContent interface. You must not edit or delete synced wordpress users or you will lose the sync. FYI: mirror WordPress users have got pvtcontent role and can't enter the admin area. Additional roles can be emulated, adding capabilities to synced users. This is managed in the related settings area. It's possible to split forms into sections. In the form builder there's an element called "paginator", using it, users will be prompted to fill one section per time. Really useful in case of complex forms. PrivateContent has got an HTML5 form validation engine acting on client-side. This offers detailed error reports to user and avoid multiple server calls. It also integrates with form sections. If fields aren't correct, user can't move to next form's section. You can also set a fluid layout for the registration form and create your color combination. By default PrivateContent has got an invisible "honey pot" system. It is almost secure as reCAPTCHA, anyway you can always choose to use this latter one. PrivateContent integrates Google invisible reCAPTCHA. You are now asked to register on Google's site and insert site + secret keys. 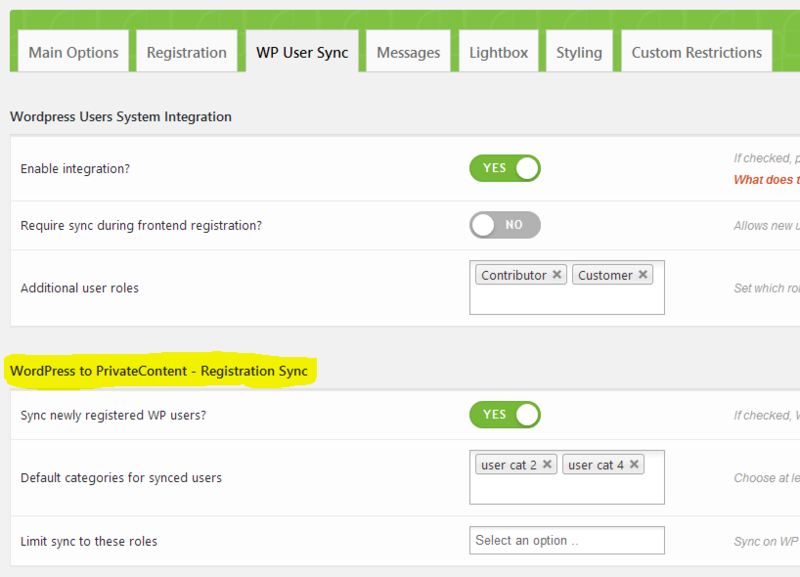 Using WP user sync system, you can also use any registration form you may have on your website to create PrivateContent users. Newly registered users will be automatically turned into PrivateContent users, then be careful to which roles they're gonna have! Since each user category and user page is deeply integrated with WordPress IDs, isn't possible to import exported users.The only way to completely move users is to move the whole site database. Just choose which user roles will be imported and which PvtContent user categories to assign. Remember that sync can't be reverted without WP users deletion, then be careful to what you sync! Select user status, file format and user categories you want to export. The resulting file will be downloaded on your desktop. Using Wordpress user sync system, PrivateContent gives you the ability to communicate with users directly on their private page. It must be synced and comments must be enabled on its private page. PrivateContent has got a powerful lightbox engine you can use to pop up forms or notifications or whatever you need. In settings you'll find the related lightbox wizard. Once added, you'll note two classes in the upper-right corner: trigger class and lightbox class. Is the class needed to launch lightboxes. In fact lightbox instances can be linked to warning box buttons, but only through these classes you'll be able to use them everywhere in your website. In this screenshot a button has been taken into considereation, but almost any Visual Composer's element has got an extra class field. 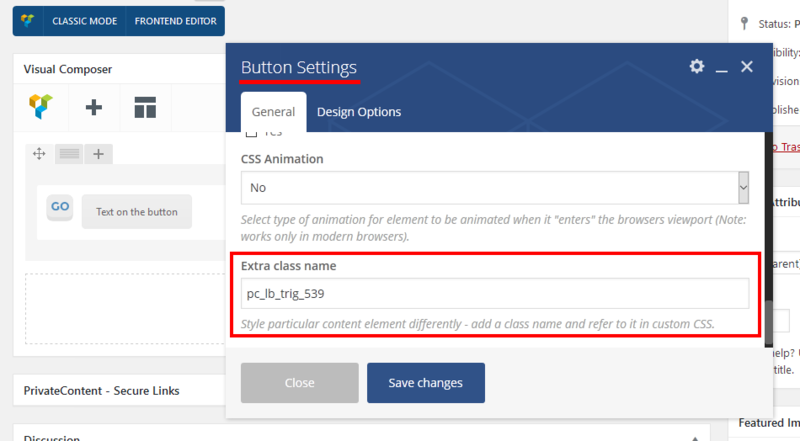 If you are using Elementor, just do the same in the related "element class" field. Simply add a "Custom link" menu using an hash as URL and any text you need. 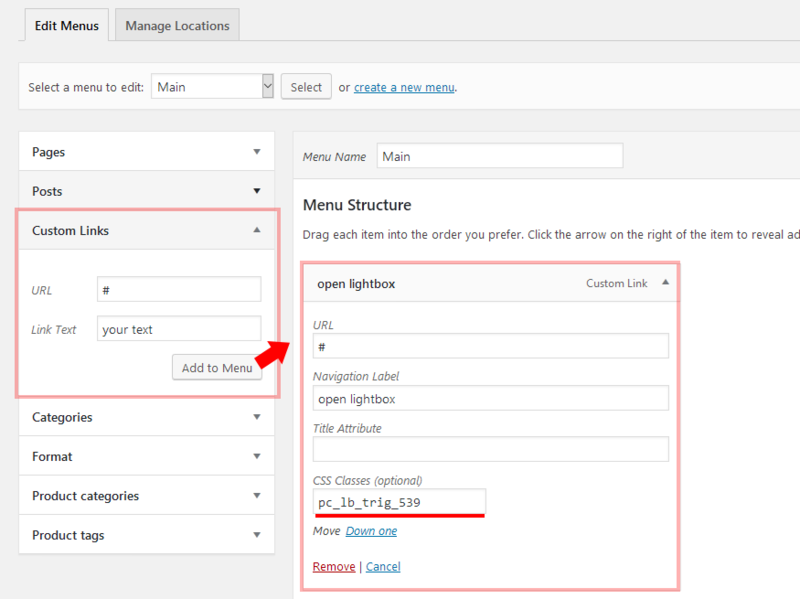 Then, once added, expand the menu item and add the class. FYI: if you don't see the class field, enable it through "Screen Options" flap, on top of the page. PrivateContent is also natively integrated with Visual Composer, Elementor and Cornerstone. Using them, you can skip the standard shortcode wizard and use the related PrivateContent tool. By default any wordpress user can access any restricted content except users private pages. PrivateContent restrictions are essentially based on user categories. Advanced users might extend this behavior using plugin's API and introducing new checks though. In any restriction block you will be asked to specify who can access specific contents. Leaving restriction options empty, no restriction will be applied. A user can access restricted elements if he belongs to AT LEAST one condition. For example if you allow "user category 1" and "user category 2", users belonging to "user category 1" OR "user category 2" will be able to access them. You might be able to also block specific users, among allowed ones. For example if you allowed "any logged user" and blocked "user category 1" and "user category 2", users belonging to "user category 1" OR "user category 2" won't be able to access contents. Through "Private Block" shortcode you can restrict targeted contents inside any page or post. Is useful to create dynamic switches. For example: show content X to unlogged and show content Y to logged. It's the main PrivateContent tool to manage your restrictions. It is shown in any linked post type and taxonomy: by default for posts, categories and pages. Remember you can extend this to custom post types and taxonomies by selecting them in settings! An essential concept to understand is inheritance. These restrictions are inherited starting from categories, passing to parent post and ending with child post. Then you can easily restrict multiple subjects by restricting a category or a common parent page. This system acts uniquely on contents, leaving posts searchable, indexable by search engines. Contents can be replaced with different options, to be chosen in settings: a warning box / no contents / the excerpt / excerpt + warning box / custom contents. If contents are hidden, also comments will. Simply set comments visibility. Optionally you can also replace them with a warning box. The most powerful privateContent restriction: totally hides elements making them unreachable and redirecting blocked users to a predefined page. It will be totally removed from wordpress queries: won't be searchable nor indexable and will be also removed from menus. Be careful setting main redirect target in settings: it MUST BE NOT restricted through this system or browser will fall into an infinite loop. This system will apply a persistent modal lightbox on page's opening. Within PrivateContent settings, you can also set custom restrictions, based on pages URL. You can use a full URL or a regular expression, allowing you to control multiple pages at once. In this image, for example, first restriction targets a single page while second one restricts any page having "category-y" in URL. PrivateContent integrates also in WordPress widgets management area, allowing you to restrict every widget. Just specify which user categories will be able to see them. You can track every step a logged user makes on your website, thanks to the native Google Analytics implementation. Just inset your tracking ID code and the plugin will start tracking users. As written under the field, you must create a new view to enable users tracking. PrivateContent is a dev-oriented plugin, ready to be extended and tweaked in any way you need. Check the Public API documentation and knowledge base to understand how. Want a new and easy income source? Create your own add-on on Codecanyon. Counting thousands of customers all around the world, PrivateContent guarantees certain sales to your product! Approved add-ons will be featured on LCweb site and mentioned in PrivateContent description. Want to join add-ons creation but need an idea to start from? Get in touch at support@lcweb.it to know what customers need right now! The plugin is 100% multilanguage for both front and back ends. If a translation of your language has been created, WordPress will automatically switch between languages. Plus it is compatible with WPML, Polylang and qTranslate! If you have WPML + String Translation add-on or Polylang, you can simply scan the plugin and translate strings via its UI. Otherwise: go in the plugin folder, you'll find two folders called "languages" and "lang_admin". Inside you'll find the default.pot file. It contains english strings to be translated. If you create new translations, please contact me at support@lcweb.it sending your .PO and .MO files. Otherwise they will be lost in next updates. Thanks!